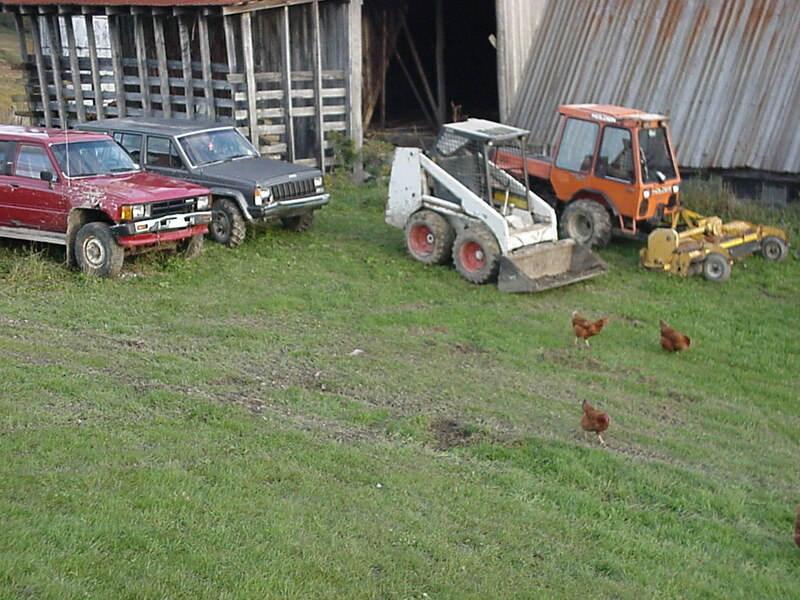 Below is a pic of my fleet of second or fifth hand machines for screwing around on my farm. First we have my latest aquire of a 1986 Toyota 4 rumnner with only 380000 miles. It is a convertible. It runs great and the 4wd drive works. It is my spare lot car. Second is my jeep with only 288000 miles. Notice the tires are from mobile irrigation machinery. The strength of the sidewall will hold the vehicle up with no air in them. The tires were only 50 bucks a piece since they are industrial tires not testonerone-hungry racer mudder tires for wayward boys. The jeep has acquired some dents in my ownership. The famous quote "what do you expect you think it is a tank" comes to mind. Thirdly we have my Model 632 bobcat. It has a 4 cylinder ford gasoline engine. It runs ok and if has no hydraulic leaks. I don't know what I did before I had a bobcat. I had to lift stuff, man. Fourthly.. you can see the crown jewel of the fleet, my germany made Holder c500 tractor. It has a 65 horse duetz diesel, heated cab, 4wd, articulated, front pto and three point hitch, dual remote hydraulics, two seats and 7 foot alamo-mott flail mower. It is cool and it is very difficult to tip over. It can go over 25 miles an hour and can be licenced for the street. It is a business man's tractor. Can you see my four free ranging chickens looking for dinner?